Stainless steel and brass fender hardware. 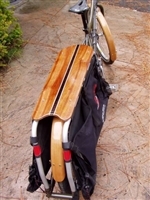 Keep your bike from leaning against the wall with a beautiful Woody's floor stand! The stand is offered in Mahogany, Cherry, Walnut, Bamboo, and Oak. Comes in standard road, city bike, and mountain bike versions. The road version accepts tires up to 1 1/4" (measured across the width of the tire), city version accepts tires up to 1 3/4" (measured across the width of the tire), and the standard mountain bike version accepts tires up to 2 1/2" (measured across the tire width). If you would like a stand made for some other tire width or wood choice please e-mail me and let's talk.